As yesterday and Sunday weren’t good blogging days, I decided to go back to my morning routine and picked up an older habit of not sitting in front of the computer to write, but instead picked up a simple pen and paper. 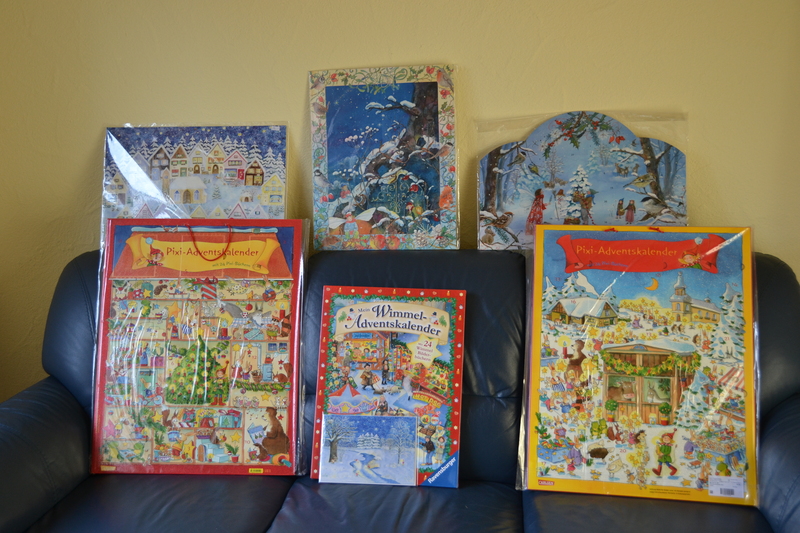 The trick worked and I deciding to write about Advent’s calendars, as it’s now three days since Advent started and I had yet to unpack them out of their plastic wrapping, let alone open the teeny little doors. 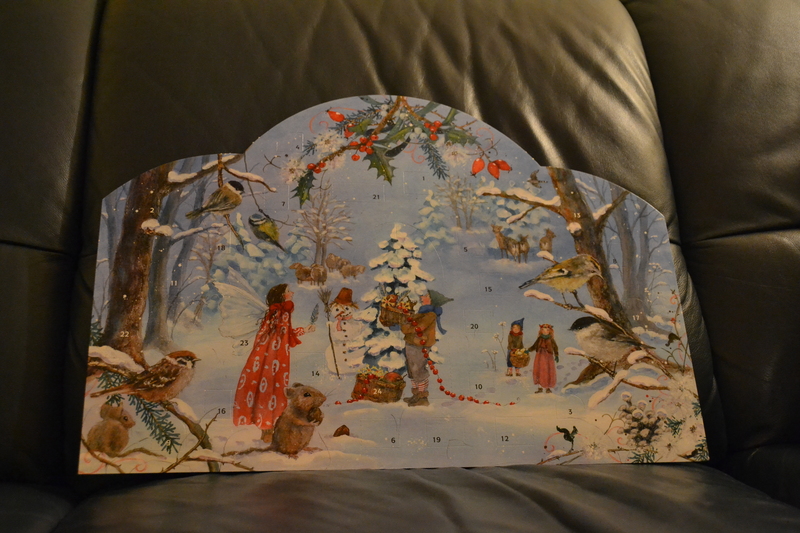 This is the first time I can remember in a long time, since I have had my own Advent’s calendar. But sometime back in November, I was in town and came across a great little children’s bookstore, which had a whole bunch of them in their window front. 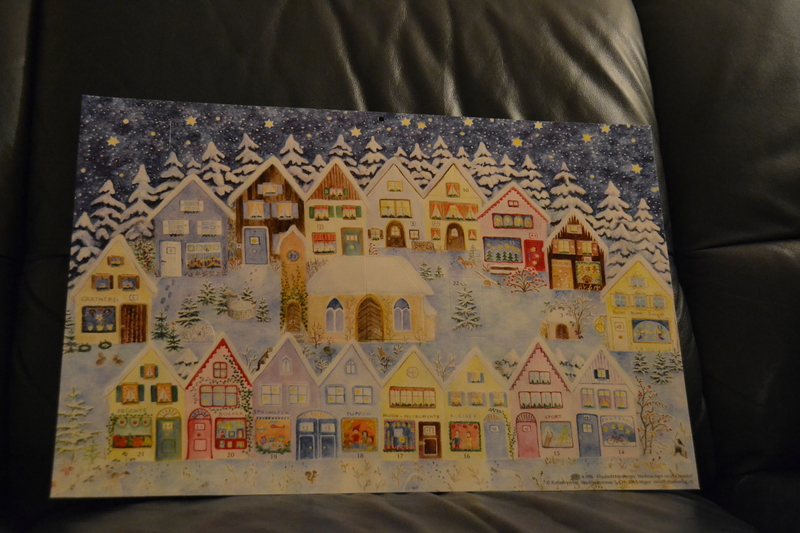 I saw this beautiful one with a beautiful illustration of a winter scene of woodland fairies and animals. It is similar to some of my favorite childhood books, about woodland animal tales. When I went into the store to find the calendar, I had to paw through a huge selection before I found it. By that time, I had fallen in love with a few others, so half an hour later, I came out with early Christmas presents for all of my friends’ kids, as well as my niece and of course one or two for myself, because I couldn’t decide which one. Well tonight, I finally opened one and left one for my husband, Yves to open. Surprisingly, despite the fact that there were no chocolates in them, he was pretty happy to have one to open. So here is a picture of his. Aside from opening my advent calendar and writing my blog, I did get a lot done today, some errands, chores and, some much needed quilting. And what a great quilting day it was. First of all, I learnt a new term: “eating a point”. That was what my sewing machine was doing to my half-square triangles on Saturday when I started to construct my small pinwheels. Of course, being a beginner, I had no idea why this kept happening, and every time I got somewhere, something else happened so that I eventually gave up, totally depressed and thinking, this is it, I can’t do this, and I will never be able to finish this quilt and thus will have failed. But then I thought ok all you need is a little break and to try again. Well I didn’t get around to it again until three days later, when I was reminded of the old adage “where there is a will there is a way”. So I sat down in front of my laptop and googled “Fanning pinwheel seams” or something similar. It took me a little while, but eventually I found what I was looking for. I came across a detailed photo tutorial of not only how to fan pinwheel seams but to also chain stitch the half-square triangles together and to press the block so the mini pinwheel is created on the wrong side of where the points meet. I read it a couple of times and followed the instructions one step after the next. Before I knew it, I was jumping up and down in pure delight. I had that little mini pinwheel which was the sign of success and my machine had only gotten stuck once in the beginning. Now the only problem is, that it looks like they are not quite the right size for the quilt I planned, but I’m not bothered much, as long as I can quilt!! It will mean some dreaded Math, to adjust the measurements, but I will survive! So, what makes me call myself a Jolly Quilter? Well as you may have figured out with the advent calendars, and the Christmas market, I’m a bit obsessed with Christmas. Yesterday, I finally did a, desperately needed, clean of my entrance, sweeping up all the leaves and dirt that had collected and carrying away some sad looking pots that had been sitting there since last summer. You could say that, since I started to quilt I have been neglecting my garden a bit. But because I love Christmas so much I decided that it was high time that I show a bit more interest in my outdoor space. Having bought a few things at the Christmas market and pulled out some decorations from last year, it was amazing how great it could look. I even brought the old rusty wire table and chairs from the back garden. All cleaned up there is a lot more space, and although the decorations make it look a 100 times better, there is still room for improvement!! I can’t wait to do some more decorating and of course more quilting. That’s why I’m the Jolly Quilter today! It just made my day to get your message. Glad you are loving my blog. Hope I can keep it up, it is tricky with everything right now, but it is a lot of fun. I’ve got a lot of work to do on it, adding pics to old posts and setting up a few more pages. The blogging is not as hard as I had feared, the quilting is though. But I’m still going to be terrible and prioritize my quilting before my German homework today. But I’ve got one and half more days to worry about my German class! Want to here what you and Robyn have been up to, but know you guys are all busy. Skype is working out well these days though. well not sure which one you are talking about. Don’t think we had one this year for ourselves. But I’m sure you are right!